The Model EWP Washing Press is a spiral press that washes organic matter out of screenings material. It washes, dewaters, compacts and transports screenings to a conveyor, container or other suitable receiving device reliably—day in and day out. Alloy steel spiral welded to the hollow shaft, which contains perforations located in the washing zone to introduce washwater to the screenings from the inside out. A nylon brush is attached to the trailing edge of the spiral to ensure debris is thoroughly removed from the drainage area. Stainless steel drain pan, located under press body. A flushing nozzle periodically rinses the drain pan. Sealed with a gasket and secured with a latching system, the drain pan is easily removed for service. Wedge-wire drain constructed of individual profile bars mounted on the bottom of the press and extends from the inlet hopper through the washing section. The wedge wire, with 2mm spacings, guarantees clog-free drainage of the wash water while ensuring screenings capture. 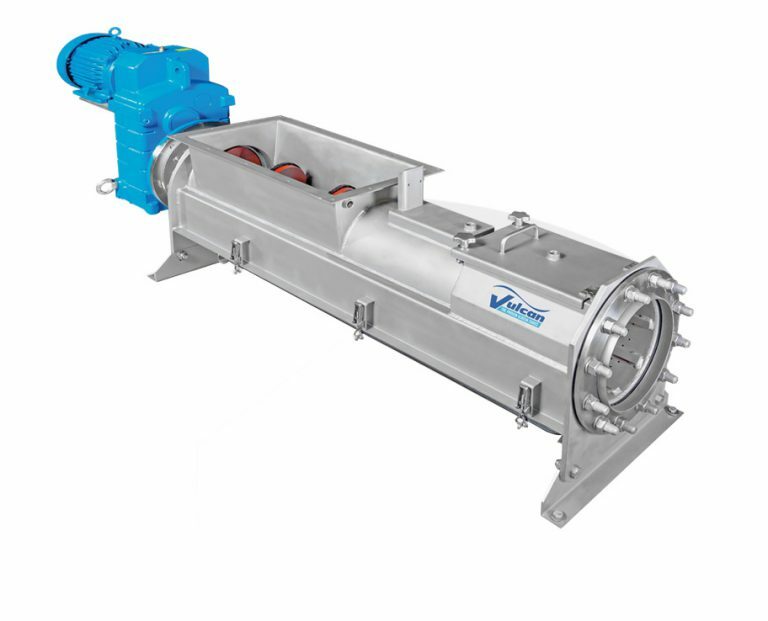 The Washing Press receives the screenings from a primary screening device, sluice trough or conveyor through the inlet hopper. The spiral transports the screenings from the inlet to the washing zone where they are compacted and washed. In the washing zone, wash water is injected into the screenings from the openings in the hollow shaft of the spiral and from a nozzle at the top of the unit. After the press compacts the screenings, the spiral reverses, pulling apart the compacted wastewater screenings. The cycle is repeated a minimum of four times, recompacting the screenings and squeezing out excess wash water and organics. The repetition helps the press achieve up to 90% organic removal from the screenings. As the screenings move into the dewatering zone, the pitch of the spiral decreases, further compacting the wastewater screenings for maximum water extraction prior to entering the discharge pipe. From inlet hopper to discharge, the wastewater screenings volume is reduced from 70% up to 85%. The Model EWP Washing Press works in conjunction with our Mensch Bar Screen, Stair Screen, Multiple Rake Bar Screen and any of our other screening equipment.